I’m excited to share with you the setting for my upcoming release in A Tuscan Legacy contemporary Christian romance series. My lovely co-authors have introduced you to the Rossi family in the following posts. Check out the links below (if you haven’t already read them) to learn more about our series. 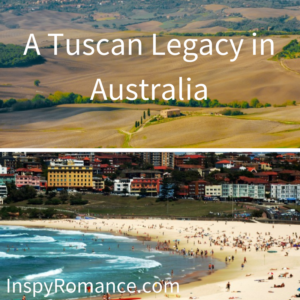 A Tuscan Legacy is a truly international contemporary Christian romance series. It spans three continents and my story, Solo Tu (Book 7) is set in Sydney, Australia. Today I thought I’d share a few of my photos and give you a snippet of the real life setting for Solo Tu. 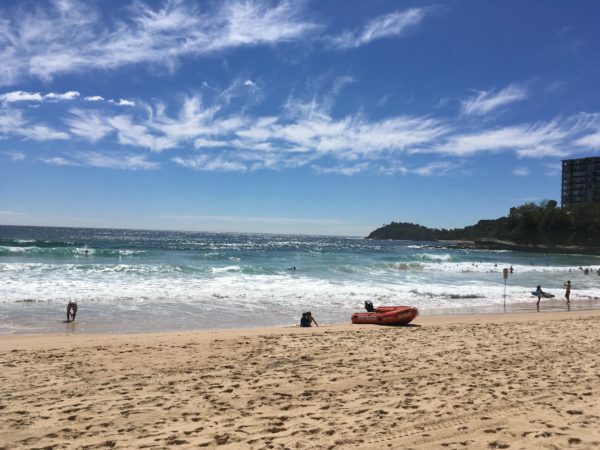 This is Little Manly Beach – the harbor beach that’s close to where Sienna Rossi lives in a high rise apartment (owned by her cousins) with stunning water views. Dave, our Aussie hero in the story, lives up the road from Sienna with his grandmother in her early twentieth century federation-style home. Sienna and Dave are both living in Manly for a season rather than long-term. This part of Sydney is prime real estate, and they’d struggle financially to pay the rent for an apartment on their school teacher salaries. 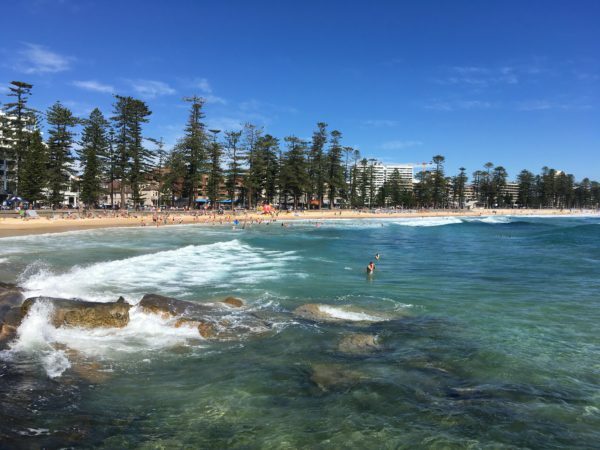 The photos above and below are from Manly Beach – the famous Sydney ocean beach that tourists catch a harbor ferry from the city to visit for a day trip. Sienna and Dave like walking together along Manly Beach and around to Shelly Beach. 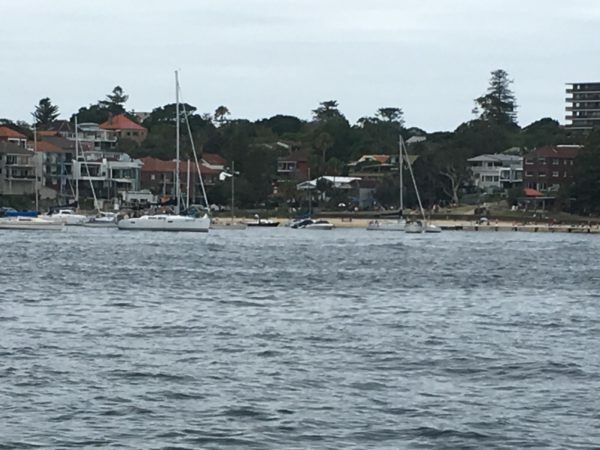 The photo below was taken from the path between Manly Beach and Shelly Beach (the path is pictured above in the photo). Who wouldn’t want to enjoy this walk? It’s a beautiful part of the world, and one of my favorite places to visit in Sydney. To keep up-to-date with when my Tuscany novella is releasing, please consider signing up for my newsletter at my website. A bit of trivia ~ I was born at Manly Hospital ~ only a short walk from where Sienna and Dave live during Solo Tu. There’s also another Inspy Romance author who was born at the same hospital. A big coincidence! Can you guess who? I’m giving away a $10 Amazon Gift Card to one commenter on this post. We’ll draw a winner on Friday, March 16, and the winner will be announced in the Sunday Edition on March 18. I’m loving the pictures thank you. It’s been a long time since I visited Manly Beach. Hi Narelle- great photos. It has been a couple years since I was last at a Sydney beach- last time we were in Sydney we were at Darling Harbour for the boys to play in the cool playground there. I have to confess to preferring the quieter beaches of the South or Central Coasts!! How cool that you and (I’m guessing:) Autumn were born at the same hospital!! PS, Your cover beach looks a lot like Bondi to me- there is a yummy gelato place nearby!! Greetings from cold snowy Michigan, Narelle! I have only traveled to Australia through the movie Crocodile Dundee and by reading Bill Bryson’s travelogue A Sunburned Country. I recognize Sydney because of New Year pictures from around the world. I believe that Autumn Macarthur is the Inspy Romance author, who was also born at Manly Hospital. I am looking forward to being an arm chair traveler with the delightful Tuscan Legacy series. I hope Dave and Sienna will enjoy Brekkie, Elevenses and Dinnies and for dessert have a piece of Pavlova with lots of sweet whipped cream. While I have traveled coast to coast in the US and 9 foreign countries on three continents, this German American has never visited Italy either. Thanks for the beautiful pictures about Sydney, but I am not familiar with Sydney beaches. After a blistering north wind, I am anxiously looking forward to warm sunny Michigan beaches. Sweet dreams since it is 9:30 in the evening in Australia. Haven’t been to Australia but hope to some day. Can’t remember which author is from Australia…..
I’ve never been to Australia, but would love to some day! I’m pretty sure Autumn is from Australia as well, so perhaps she was born in the same hospital? I’ve never been to Australia but I know people who have. Going to Sydney was at the top of their bucket list. wow, what gorgeous pictures. ohh, that water is incredible. looks like a lot of inspiration for your book. Have never been, but would love to someday. Haven’t been to Australia yet, but it’s definitely on my (admittedly, very long) list! Isn’t Autumn Macarthur also originally from Australia? I have loved the chance to read the first book in this series, and I am having a hard time waiting for each new story to be released! These pictures of the setting, and the other pictures Marion shared have really helped me to visualize where the stories are set. Books help us to visit places that we might never get to see in person. Same here! The first book is terrific! I have never been to Australia, but it looks like a wonderful place to visit. I must say that some of the pictures I see of huge bugs or snakes kind of freaks me out though. The coast is beautiful. I’ve never been to Australia but enjoy reading or watching documentaries about it. God bless! Hi Diana, The Australian Coast is beautiful and the scenery is diverse, depending on where you visit. The Great Ocean Road in Victoria is very different to the tropical beaches and the Great Barrier Reef in North Queensland. Western Australia has magnificent coastal destinations you can visit, too. Awww Narelle! You’re making me homesick! Glad I remembered correctly! Looking forward to your book also? I’ve never been to Australia, but I’d love to go some day. Thanks for posting the pictures! We visited Australia and New Zealand last October. We loved touring Sydney. We didn’t begin to see all of Australia, but what we saw was marvelous. Thanks for sharing about A Tuscan Legacy. I’m looking forward to these books with such a great collection of authors. I’ve never been to Australia, but would love too. I have friends who like to travel the world and I was just telling one of them yesterday that if I was to pick one of the places he’s gone, it would be the Australia/New Zealand trip from last year. It was just amazing to see soo many beautiful places close by. Beautiful pictures and what a great setting for a book. I’m not into world travel or exotic vacations. I like visiting family on our trips and all of our family is in the U.S. I guess because that’ s what my parents did when I was growing up. But I think if I ever left the U.S., it would be to visit Australia. Hi Narelle from cold and snowy West Virginia. I have never been to Australia but it has always fascinated me. I learned a lot about Australia thanks to an online friend sending me a box of goodies and information about Australia. It was so much fun learning about Australia thanks to her generosity. She lived in Perth Australia. Sadly, over the years we have lost touch with each other. I still have the boomerang that she sent to me. I believe it is Autumn Macarthur that was born in the same hospital in Manly. I’ve never been to Australia, but I’d love to go. Your pictures make me want to go even more. The cover of A Tuscan Legacy is gorgeous. It definitely makes me want to grab and read! I love the picture you shared of the path between between Manly beach and Shelly beach. I’ve never been to Australia but I would like to visit someday (although I’m not too sure about the flight. lol). Hi Jessica, I hope you’ll have a chance to visit Manly and walk along the path. The direct flights from LA/San Fran/Dallas are long. It can work out cheaper to fly to Australia via Hawaii or New Zealand, which breaks up the trip. Hawaii to Sydney is 8 or 9 hours, and it’s faster if you fly into Brisbane, Queensland. Hubby and I visited his brother in Melbourne in 2003. Then in about 2005, I took a short business trip to Sydney and Adelaide. Saw Bondi beach and had an awesome dinner at a fancy restaurant at the Sydney opera house. Love your pictures! I’ve visited Australia in books & movies, but never in person. That’s definitely on my bucket list! I have always wanted to visit Australia. My father lived in Longreach,Queensland for a time during WWII. I guessed Julie tye Duncan as being from Manly. Thanks for the pictures. I’ve got cousins and friends in Australia, but haven’t been there yet. Never been to Australia but love armchair travels! Looking forward to reading your book. I’ve never been to Australia but I’d love to go.It’s so beautiful. I have never been to Australia. I also don’t recognize the beach. The book sounds interesting. Thanks for the chance to win. The pictures are beautiful! Thank you for the post, enjoyed reading it! Blessings! Have never visited in person, but have seen it in movies and on tv. I would love to visit, though. Hopefully some day! I’ve never traveled outside of the US. Love these beach pictures, especially when it’s been so cold here in TN!